Succulents are beautiful, low maintenance, and fun to grow. By learning how to make a succulent terrarium, you can bring a bit of nature indoors for the cooler months with a minimal amount of effort. These succulent bowl gardens will thrive indoors! Succulent bowls have become more common in recent years. They’re an easy way to welcome some natural life indoors or onto the patio. They make lovely centrepieces, or if you’re like me, lovely collections! Some plants are planted into an open succulent terrarium. Succulent terrariums are often open to the atmosphere rather than sealed to create their own water cycle. Succulents are very low-maintenance. They truly do thrive on neglect. If you go away for the holidays, these plants will survive without water for weeks. In fact, the only succulents I’ve killed died because I over-watered them (I was just trying to love them!). Planting a succulent in a bowl is slightly more tricky than planting it in a proper plant pot. Most plant pots have drainage holes, which allow excess water to drain out of the bottom. Bowls don’t have drainage holes to let excess water out. The nice thing about using a bowl instead of a plant pot with a drainage hole is that you don’t have to put a dish under the bowl to collect excess water. Bowls are therefore much prettier to use as an indoor piece of garden art. Normally, I would discourage against planting anything in a container without drainage. It’s usually easier to drill a hole in a container than it is to deal with the consequences of not having proper drainage. Succulents, however, have such low water requirements that you can get away with using a bowl IF you use high-quality potting soil and don’t over-water the plants. The lack of a drainage hole also prevents water stains on your table! Some bowls without drainage holes, such as the concrete bowl pictured above, do allow a tiny bit of drainage because the bowl material is slightly porous. Concrete, unglazed pottery, and terra cotta bowls will allow a touch of water through the walls. Glass bowls are non-porous and will not allow water (or air) to pass through the walls. The most important part about how to plant succulents in glass containers is not to over water your succulent glass bowl! Succulent terrarium health issues are generally related to overwatering rather than underwatering. Overwatering really is the easiest way to kill your succulent terrarium. Remember that you don’t have to saturate all the soil in the bowl when you water the plant. Succulents are very efficient at finding and using small amounts of water available in the soil around their roots. If your succulent is looking unhappy and you’ve watered it in the last few weeks, it’s likely feeling drowned. So how do you avoid overwatering your succulent glass bowl? As soon as you’ve planted it, take note of how heavy the bowl is. Pick the planted succulent glass bowl up a few days later and notice if it’s any lighter. It may dry out faster in dry weather than during periods of high humidity. Wait until the planted glass bowl feels significantly lighter than when it was first planted. Then give it a gentle watering. You do not need to saturate all the soil! Just saturate the soil around the base of the succulent. The succulent will find the water. When planting only a few succulents, use an uneven number of plants. 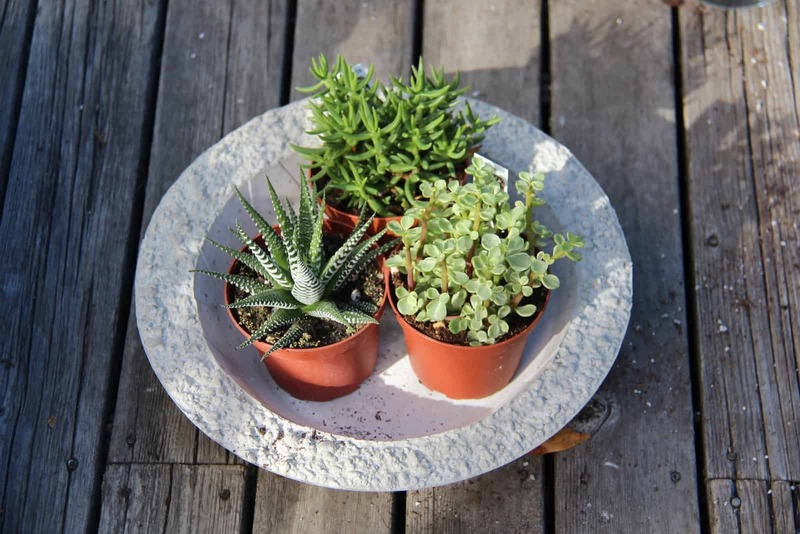 Try to find succulents with different heights and textures to add interest to the bowl. Succulents are often cheaper to buy online (or get them from a friend!). Unglazed porous material like concrete or terra cotta is best, as the bowl will absorb a small amount of water. Planting succulents in a glass bowl is totally possible…just be extra careful about not overwatering. Homemade soil mix of 50% regular potting soil, 25% sand, and 25% perlite. White sand can look lovely, but will have to be refreshed now and then as it washes into the soil. Black sand is lower maintenance as it camouflages any soil that’s showing and rarely requires replacement. If you want to get fancy, or are already an avid succulent terrarium gardener, you’re welcome to add volcanic pebbles (the kind with air holes in them) or perlite to the bottom of the bowl to create a bit of drainage space. Just because you add pebbles on the bottom though, doesn’t mean you can consider over-watering your succulent. Pebbles won’t save you from drowning your desert-loving plant. Again, if you’re feeling fancy, you can also add activated charcoal to add a water filtration feature to your bowl. I’ve planted succulent bowls both with and without pebbles and charcoal on the bottom, and I haven’t seen a huge difference. If adding them makes you feel more comfortable however, then by all means, add them. You only need a small layer of charcoal in your succulent bowl. Take each succulent out of the nursery plant pot. If the succulent’s roots are visible on the outside of the soil, gently massage them so they become loose and more natural-looking. Remove any spent leaves from the plant. Place the succulents in the bowl. Make note of each succulent’s soil level and compare it to the height of the succulent bowl’s edge. Ideally, the top of the soil should be just over 1 cm (1/2″) below the edge of the bowl. The purpose of this sunken soil level is to allow for later placement of decorative sand, and to ensure there is still a bit of room left for watering the succulent. If the soil is higher than 1 cm, loosen and remove some soil from the bottom of the plant until the desired height is reached. Spread the longer roots out along the bottom of the bowl. 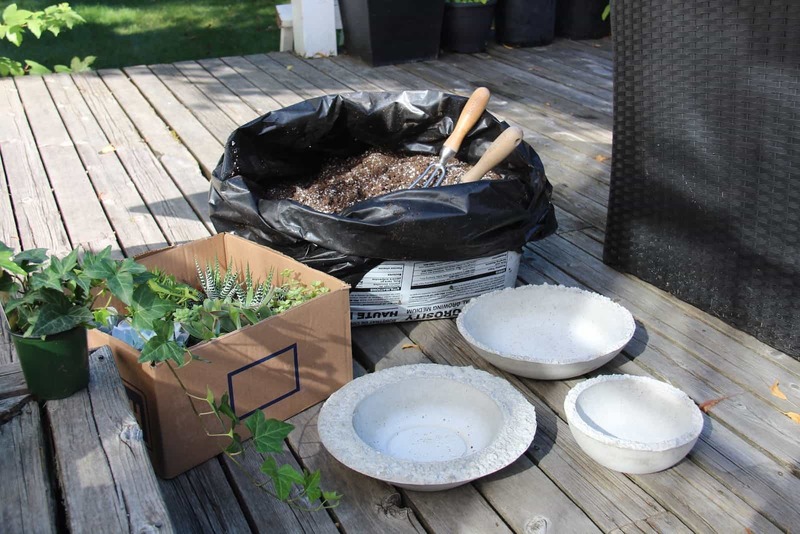 Use the potting soil to fill in the remaining volume of the bowl area. Keep the soil level just over 1 cm below the edge of the bowl. 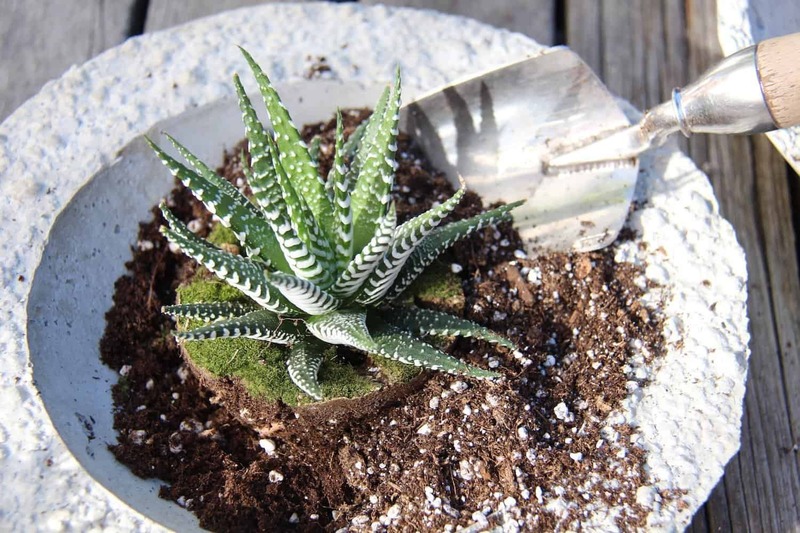 Use the small paint brush to brush any potting soil on the ledge of the bowl back into the middle. Brush the potting soil down the inner sides of the bowl so that there is no stray soil. If there is soil on the leaves, use the brush to clean off the succulents. Gently pat down the potting soil to create a flat surface upon which to place the sand. Carefully pour out the decorative sand onto the top of the potting soil. Use the spoon to work the sand up against the succulents. Use the paintbrush to brush any stray sand off of the succulents or off the ledge of the bowl. Carefully drip filtered water down any leaves that are dusty as a result of planting the succulents. This will wash the leaves and make the bowl look finished. Only apply a few drops to each plant (don’t overwater!). As an optional bonus, decorate the sand surface with a few rocks, small pieces of driftwood, or even figurines. As mentioned above, succulents thrive on neglect. Honestly. If you “love” them to much (AKA overwater), succulents can die surprisingly quickly. Succulents appreciate their soil drying out completely between waterings. Also remember that you don’t have to saturate all the soil in the bowl to water the plant. Simply water sparingly around the plant itself and allow the water to diffuse into the surrounding dry soil. On the other end of the scale, if you forget about your DIY succulent terrarium and the leaves start to dry and shrivel, the plants can usually be brought back from the edge with some careful light watering. If you forget to water for several months, most succulents will probably live (I have done this on numerous occasions…I’m not proud). Make note of any watering instructions that come with the plant when you buy it. Some succulents can handle weekly waterings, while others prefer to receive water monthly. In general, succulents with fleshier, thicker leaves can hold more water (and last longer between waterings). If you know the outdoor climate that the plant will survive in, that can also give you some clues about how tough it will be in different growing environments. Like many of us, succulents love the sun…but not TOO much sun. Their leaves can actually become scorched if they’re out on a hot concrete patio in a particularly sunny area. This is particularly true if the plant has become accustomed to living indoors. Place your succulent bowl somewhere it will get 6-8 hours of sun each day, preferably in the morning. Soft morning light is preferable to harsh afternoon light, as it’s much less likely to scorch the leaves. You can also use a mini LED plant light if you’re worried your succulent bowl isn’t getting enough light. Some hardy succulents will tolerate limited below-freezing weather, but most of the varieties available year-round at the hardware store will not. 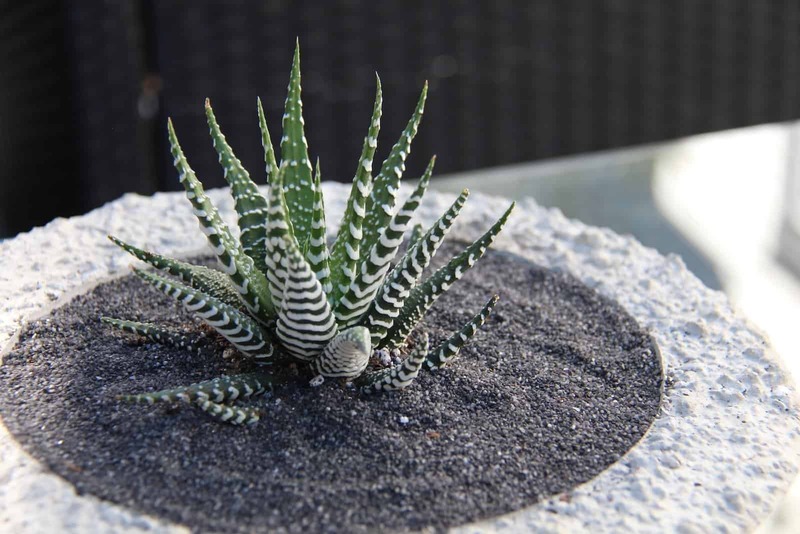 The Haworthia/Zebra plant below is definitely not going to survive our freezing Canadian winters! If you’re not sure that the succulents you’ve purchased for your succulent terrarium are hardy, it’s best to do some research on the type or take them indoors during the winter. 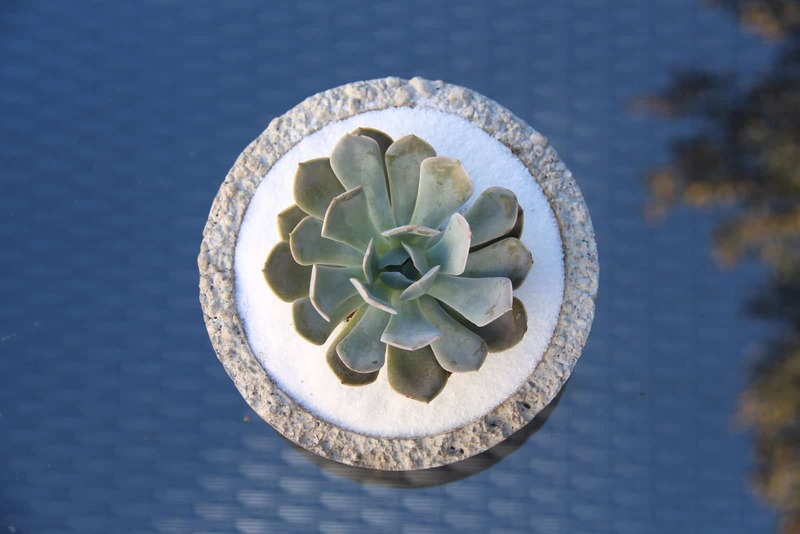 There are a few other factors of the growing environment consider for your succulent bowl. Since your succulent is in potting mix, not natural soil, it will need some plant food now and then. Succulents need feeding most often when they’re actively growing. I feed my succulents once every month or two in the summertime when the sun is out encouraging growth. To feed my succulents, I soak a bit of homemade organic compost or store-bought worm castings in filtered water for 2 days, stirring regularly. Then I use this “plant food tea” to water the succulents the next time they’re due for watering. This method is safe for use in organic gardens. You can also buy specialized organic cactus+succulent plant food. Read more about organic fertilizers here. One more note about mimicking the natural environment is not to put your succulent in a closed terrarium or under a glass container. They like air circulation. Imagine the cool evening breeze in the desert blowing over wild succulents…don’t trap them in an enclosed environment. An open succulent glass bowl will be much better than a sealed glass terrarium. Which succulent plants are your favourite? Have you ever tried planting them in a bowl? What about succulent glass bowl? Are you already teaching your friends how to make a succulent terrarium? Share your stories and questions in the comments section below! This is a great post Mary Jane! My succulent is on the verge of dying so I will use these tips to try and care it back to life. I’ll let you know how I go! I love succulents and your photos are gorgeous! Thank you so much Kirsty! Succulents is something I have never tried to plant or grow. Loving all the containers and these look beautiful. Succulents are so lovely to grow, especially in the winter when it’s snowy outside. Thanks so much for the kind words, and for stopping by! Nice plants & indeed very nice for indoor decoration too! I love my new succulent bowl! Thanks so much for the instructions. It was much better to make it myself than to get one from the flower shop!